Are you are in the Midwest area? Complete less motor and Trans, setup for big block and powerglide. Best run 7.60 @ 175.71 mph on mild home built 498” Chev. Best 60’ 107.5. 1988 Billet Car-Front and Back Half by Robert Stirling 1993 including body, New cage 1999, Currrent 7.50 tag until March 2015, easy upgrade to 6.00 Crow camlock Belts, good to April 2014, M/T Tires on Center Line Wheels all around 32/14.5X 15.0 on back M-W Aluminum center section w/ big pinion gear, 35 spline axles, brakes and rotors. Wilwood pads. Less than 75 runs on new brakepads and rotors, M-W couplers and driveshafts, Gauges, AutoMeter Shift Light, playback tach, MSD 7AL-3 box, and coil, Hooks hard, goes straight, and easy car to drive. Literally put your motor and trans in and go run! $9,000.00. Almost new Simpson FireSuit and Helmet available as an option. 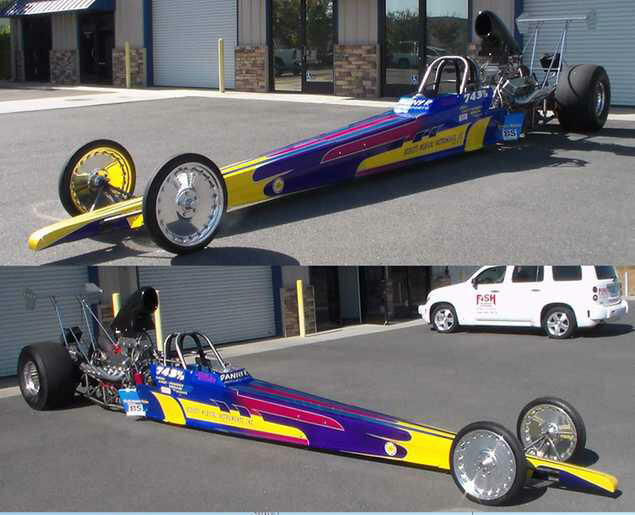 A nice 2001 Stirling dragster built for J/r fuel so you know its light, has run 7.05 -189 mph, owner has health problems so it’s now for sale, 6’-215# driver fits and there is a seat for a smaller driver, Carbon brakes, 12 bolt drop out center section with 3.89 gears, Mikes monster glide with 4800 stall 10” converter, New 468 big block Chev –Ro- Lay bugcatcher injector, Littelfield retro 6-71 blower, Littelfield manifold, 110 pump, 8MM drive, Donovan geardrive, Milodon oil pan, Callies crank, GRP rods, Arias pistons, Akerly & Childs rings, Brodix heads, T&D rockers, Enclosed trailer, new Simpson firesuit 6’200#, fuel jugs, jack, Bring your helmet…and $27,000 and lets go to the track!